KEUKEN #4: THE JOLLY CAMARADERIE. As Keuken happens annually, they always feature different highlighted booths. 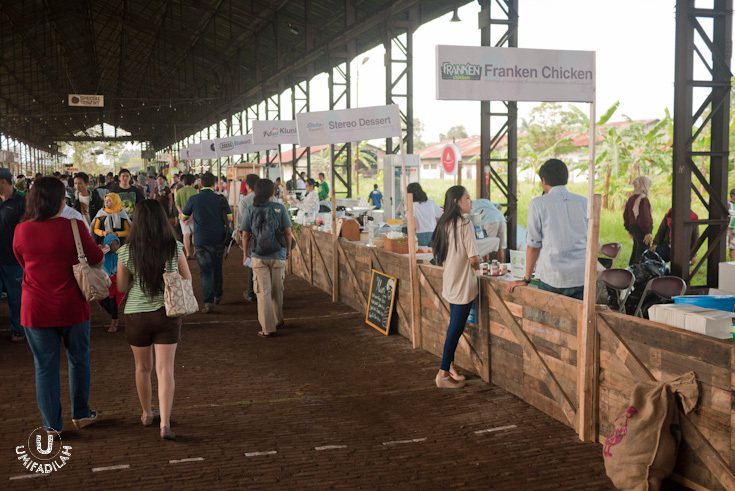 This year’s big players were: Holycow, Sugarush, Sushi Groove & Pizza e Birra from the almighty Ismaya Group, Fabrik Eatery & Bar, and Altima Group who brought us to Karnivor & Nanny’s Pavillon. It’s quite funny for me, now that I feel more like ‘Jakartans’ I wasn’t really digging these highlighted booths, simply because I could just easily get a taste of each everyday if I wanted to. And most of them are so familiar and needless to say, why eat those kind of meals on a Food Festival that's only held ONCE in a year, when it’s more comfortable to just eat them in the restaurant itself, any time of the year. 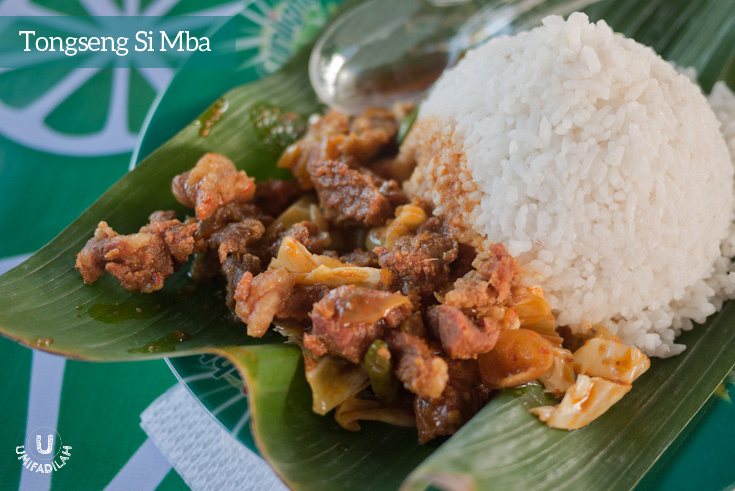 Tongseng Si Mba (IDR 20k): Goat and beef stew dishes in curry-like soup with fresh vegetables. This was the 1st tenant we tasted in the morning, quite some heavy meal starters we got here, lol. Tongseng, as how they described it, is Goat and beef stew dishes in curry-like soup with fresh vegetables, served with abundant amount of steamed rice. And this tongseng in particular, they claim it as a special dish that is only served at home after Eid Al-Adha or ‘Lebaran Haji’. The beef stew itself contains fresh mutton, cabbage, shallots, cloves, tomato, and bird-eye chili to add more heat. Served on a bed of banana leaves, it tasted really really good. 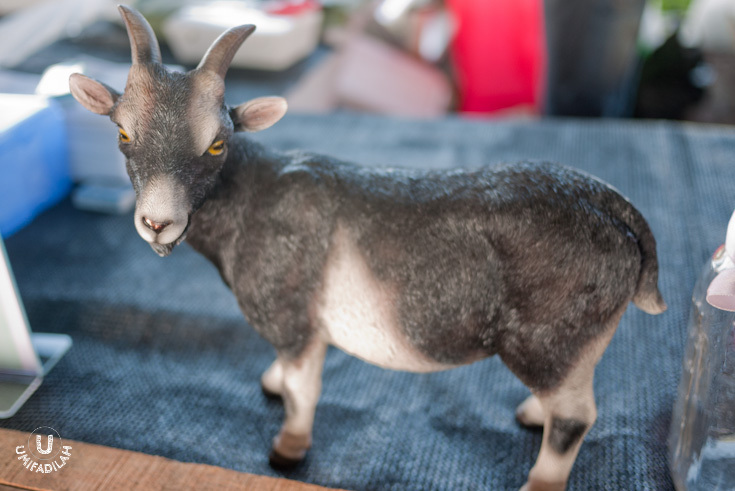 No stingy goat aroma, enough heat, and the broth is to die for! Need additional bowl of broth per serving. Mie Merapi Bakso. Wheat spicy noodles with meatballs and half hard-boiled egg. So my conclusion based on what I ate, it’s basically water-spinach noodle with meatball & half hard-boiled egg in a herbal broth that almost tasted like Thai’s Tom Yum. You can adjust the level of spiciness, but level 7 was not as spicy as I would’ve thought. But overall it tasted great because their homemade noodle eventually works with the whole thing. The interplay of crunchy water-spinach texture, with chewy wheat noodle and refreshing broth is enough. I can see how this can become an alternative to Bandung’s infamous Yamin noodle. For IDR 8.000/pcs I’d say: Good taste, but that’s it. Sorry, I’m no fan of fancy, overrated, touristy batagor such as Kingsley & Riri. And this was just on the same level. 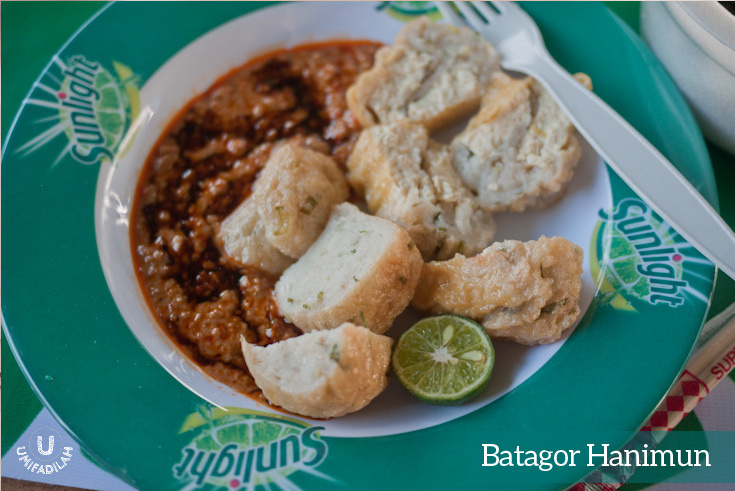 I'm still keeping my eye on Batagor Abuy & Batagor Isan in Bandung. Poutine is basically Canadian comfort food made of french fries drenched in brown gravy and cheese curds. 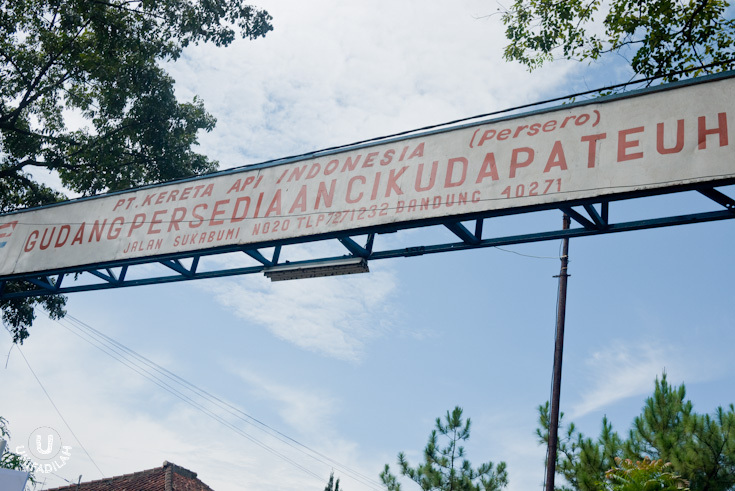 I was quite surprised that this was available in Bandung, very interesting. 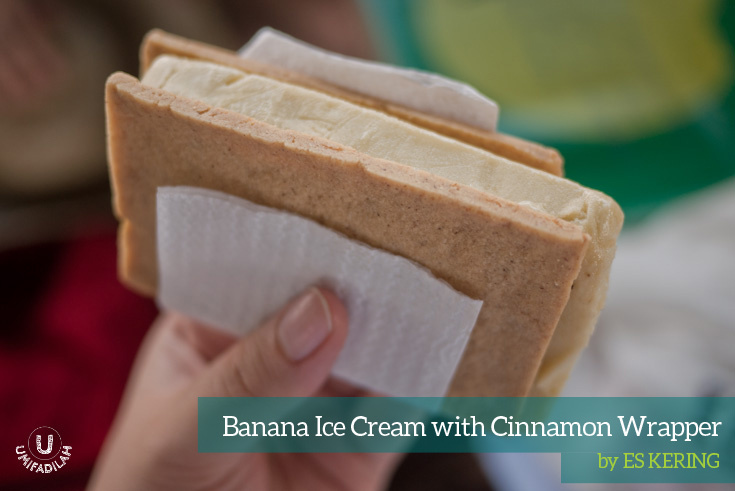 At IDR 18k, these combination can never really go wrong. Although for me the chicken needs a pinch more seasoning and a crack of peppercorn, but the cheese curds & gravy were perfectly done. Feel like dipping everything to the yummy gravy! Corndog! 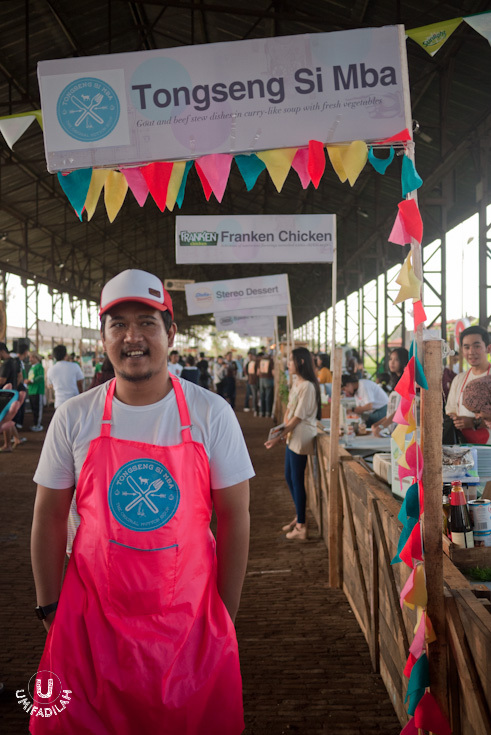 At a food festival in Indonesia! Yes, quite a rare finding so that’s what made me quite curious to try this out. Not exactly the best tasting corndog I have ever tasted, but sure is a decent introduction to people who have never eaten this before. This deep-fried cornmeal-wrapped sausage is already tasty with simple condiments such as ketchup & mustard. But Gian’ts Corndog also offer additional smear of melting cheese sauce, which made it even tastier (and spiked a few more extra calories, undoubtedly). 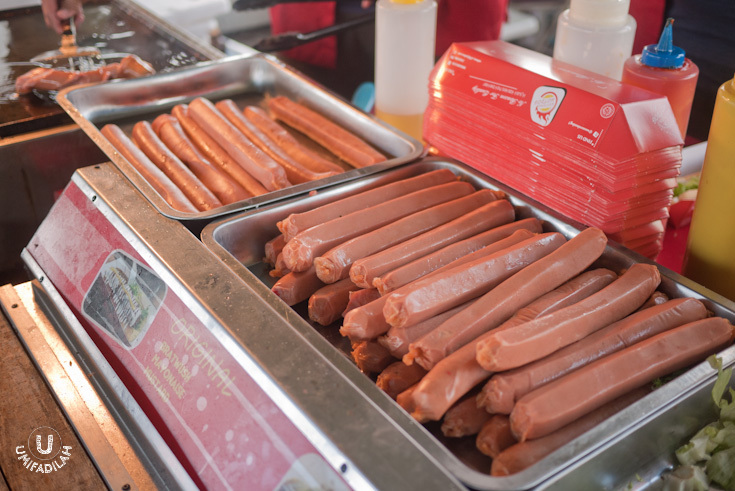 Regular corn dog (IDR 15k). I have no idea what had gotten into our minds that day, but we did try lots of different sausages. 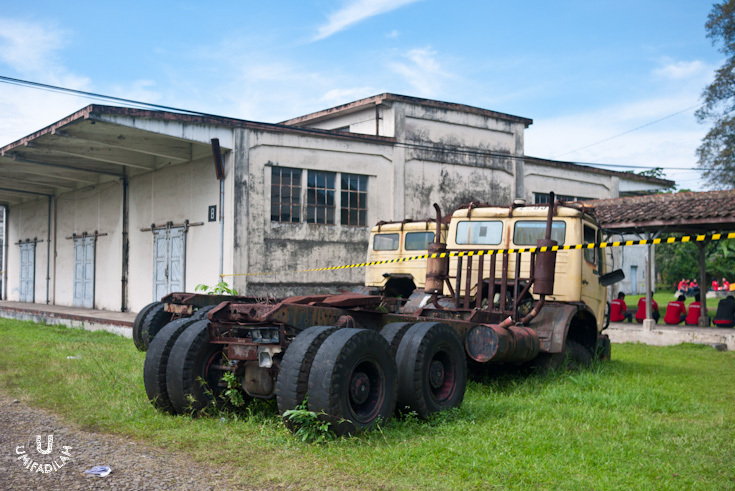 And this was another God-knows-what-is-it-inside-that processed sausages. Tried their Japadog (which you probably already figured by now, stands for Japanese Hotdog), with bonito flakes/katsuoboshi and mayo on top, which leads to the name of “Okonomi”; from okonomiyaki. Yeah, as we’d thought, we ended up ditching the hotdog bun because in the end it was just... so so. Japadog Okonomi from the Western Hotdog tenant. Translated as “grilled durian”, I was expecting some smoky aroma post-being grilled or roasted or whatever that involves direct fire. But again, if by “grilling” they meant: heating big dollops of durian + black sticky rice on a microwave-safe bowl, in a microwave oven, then I don’t know, in my opinion its name was totally misleading. The result is hot dessert consists of melting durian plus gooey sticky rice with generous nuts topping. Tasty, of course, but you can already imagine how this taste. Maybe should have picked Durian Chips instead as snacks. 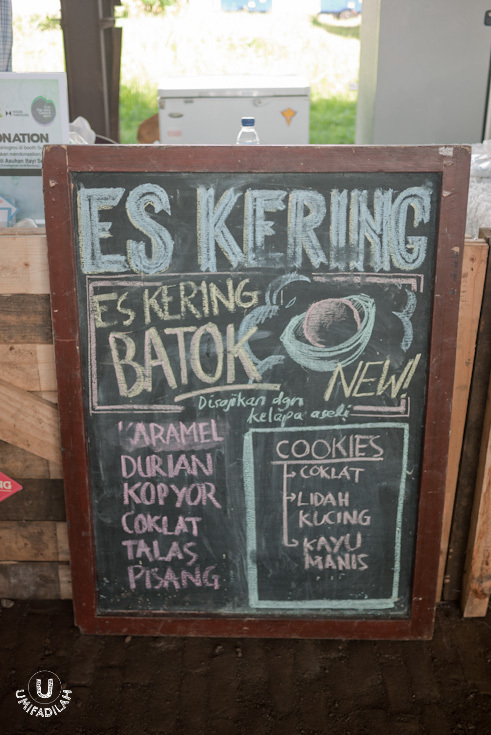 Almost the same concept with ‘Es Potong Singapore’ (Singaporean ice cream sandwich), they offer 6 different ice cream flavor: chocolate, banana, taro/yam, durian, kopyor, and caramel. 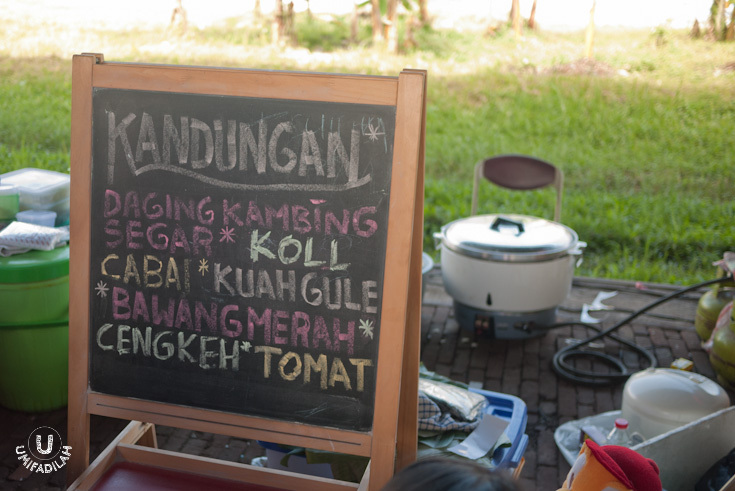 From there, you can choose your wrapper, it’s either bread or cookies (chocolate, lidah kucing/kattetong, or cinnamon-flavored, all IDR 10k), or, using real coconut shell (IDR 15k). I love their ice cream, but the super-hot weather tends to melt them very quick. And wrapper was SO crumbly that everything just turned into a big mess while eating. Probably should have chosen typical green pandan bread instead. Yes, quite surprising to see Greek cuisine being served at our local food festival. Despite the varying souvlaki and tempting Greek pies, my pick goes to Moussaka (IDR 17k), a casserole dish containing potato, cheese, minced beef and eggplant – somewhat looks like Italian Lasagna. I love this! Generous minced meat, smooth eggplant layer, and dense potato with melting cheese on top, just works the way I’d imagined. We also tried Loukomades (IDR 15k), a traditional Greek doughnut, deep fried and then added condensed milk + yoghurt sauce, honey, and grated cheddar on top. A bit too sweet for me and I can barely taste the yoghurt in it. Definitely need more acidity kick but the donut itself is different from our typical donut. More chewy, but still in a good way acceptable. This was another interesting stall but we got loaded with too many stuff already so my friend decided to buy some for take-away. Looking good, neatly wrapped inside vacuum-packed bag, and it smells really good! Will keep my eye on this one as well, for later purchase. 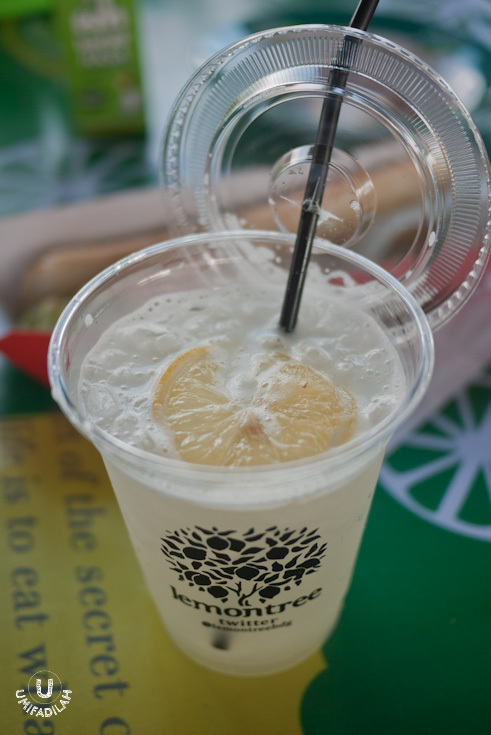 I should thank the weather for making me crave for some Classic Lemonade on a sunny 33⁰C. This might just be the ultimate drink that everyone should opt for, because it’s super refreshing! It quenches your thirst, not too sour, perfect amount of coolness, it’s everything you could ask for on a bright terik day. They also offer Flavored Lemonade, you can choose between apple, mango, blackcurrant, peach, cranberry and passion fruit. But I’m old fashioned. I want mine to be flavored only with huge imported lemon. And drink it to myself. Gosh this was really good. And with that, I’m ending my Keuken journey. Yes, 4 hours is nearly enough because as the afternoon kicks in, the crowd will be doubled and I would always prefer going to a food festival first thing in the morning. That, if you’re like me, going after the culinary trip only, don't know don't care about the performing bands or DJ :p.
Other than that, I also noticed some 'Features' that should be worth-noting. 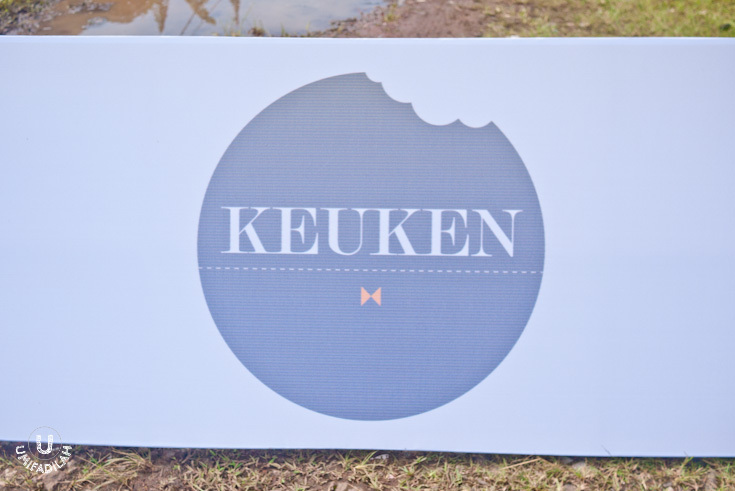 Can't wait to see what Keuken has for next year's 5th annual event! 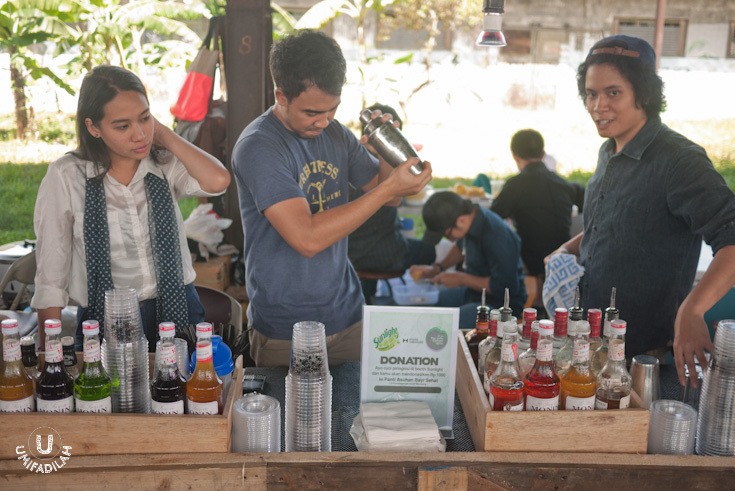 Spice and Spaces, a pop-up store providing curated goods as ready-to-serve food, cooking instruments, merchandises, etc. SO TEMPTING!